Our adventure to India is not for the fainthearted. The traffic is madness, the flavours mind-blowing and the colours so vivid you’ll be reaching for your sunglasses. On our 10-day North India escape, we’ll immerse you in chanting temple rituals and take train rides through the Rajasthani countryside. We’ll join laughing yoga classes and drink chai with local families. 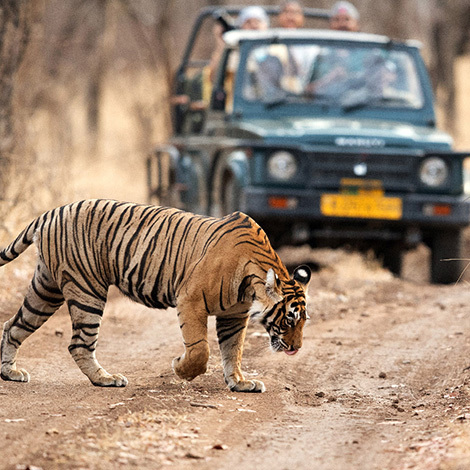 We’ll hike through mountains, and go on dawn and dusk safaris in the Ranthambore National Park. There are sunrise visits to the Taj Mahal, early morning bike rides in Jaipur and an optional hot air balloon ride over Amber Fort at dawn. Yes, there will be early starts but a night in a Rajasthani palace should sweeten the deal. Or how about the infinity pool of a luxury fort? Perhaps a massage in a boutique spa is more your style. Quite frankly, who wants a lie-in when the dazzling wonders of India await? Indulgent and elegant, this hotel will transport you to a world of soft furnishings and matchless refinement. Decked out with a bar, restaurant and spa, this is the perfect retreat after hours spent exploring the streets of New Delhi. You’ll be blown away by the ornate facade of this once royal household and it gets better inside. Colourful and intricate patterns and frescoes fill the lobby, and the rooms’ individually-picked and artisan-made furniture makes each one a showstopper. The vast pool, the fancy spa and the mural-filled dining room are big draw cards here – grab a taste of life as a monarch. A breathtaking fortress with 360-degree views across the Rajasthani countryside and a collection of pretty and ornate guest rooms. Step off the plane in Delhi and prepare for 10 days of unforgettable adventure. Touch down before 4pm, where your private transfer will await to sweep you off into the heart of the city. After freshening up at your hotel and meeting your guide and fellow adventurers, we’ll dive headfirst into the spice-infused streets. As the unofficial capital of modern India, Delhi is abuzz with energy. Dodge tuk-tuks and weave through the hectic hustle and bustle, as you take in the city’s unique sights. Ancient history collides with modern culture to create an exotic blend of old and new, creating a mesmerising backdrop as we head to a local restaurant for dinner. Feast upon your first proper taste of Indian food and see which of your fellow Flashpackers can handle the heat. Tuck in and enjoy, there’s plenty of spicy adventure ahead! After breakfast at your hotel, we’ll embrace the chaos of Delhi, weaving our way through the streets and alleyways, passing a rich tapestry of haggling merchants and bold colours. Delhi has seen the rise and fall of many an emperor, so in the midst of everyday life are grand monuments and palaces tucked away in hidden courtyards. We’ll veer into one such courtyard, winding down a narrow snicket to discover a serene haveli (townhouse), where we’ll enjoy a delicious lunch in an oasis of calm. Afterwards, we’ll carry onto Bangla Sahib Gurudwara, a beautiful temple that provides a free lunch for anyone that enters its doors, no matter your background or wealth. This is an amazing sight to behold, watching people from all walks of life sit side by side and break bread together. The rest of the afternoon is yours to as you please, be it kicking back by the hotel pool or bartering your way through the food markets. Bid farewell to the delights of Delhi as we journey south to the colourful city of Agra in Uttar Pradesh. It’s a four-hour drive so settle in for the drive of your life: from decorated elephants strolling the roads to sacred cows causing congestion or goats perched on mopeds, the traffic here promises 24-7 entertainment. Reaching Agra, we’ll check into our hotel before heading out to one of the city’s most striking sights. The mighty Agra Fort overlooks the banks of the Yamuna River, shrouding a palatial city within its ancient red walls. We’ll explore the archways, courtyards and chambers of this royal residence, hearing the exotic stories of past rulers brought to life. Then transport yourself back to modern day at your contemporary hotel, where you can get an early night before tomorrow’s sunrise visit to the Taj Mahal. It may be an early start but you won’t be hitting the snooze button – the Taj Mahal awaits. We’ll watch as the ethereal pre-dawn light bathes this perfectly symmetrical temple in a pink hue. Then, as the sun rises, beams of fiery gold will light up every crevice of the white marble mausoleum. Marvel at the architectonic beauty of the one of the world’s finest wonders, built in the 17th Century on the orders of Mughal emperor Shah Jahan, in tribute to his favourite wife. A poolside breakfast will be waiting for you back at your hotel, and then we’ll travel south to Sawai Madhopur via a three-hour train ride – a quintessential India experience, and a chance to soak up the country’s chaotic spirit and beguiling scenery. From here we’ll drive into the rugged beauty of Ranthambore National Park, and check into your cottages for dinner. Your neighbours include wild tigers roaming the reserve, all set for tomorrow’s safari. Wake up in one of the best places in the world to see wild tigers, and get ready to jump in open-top jeeps for an early morning safari. This is a great time of day to spot these majestic predators, prowling through the grasses or padding along the dusty tracks. There’s also plenty of other wildlife to see if the tigers are feeling shy, with leopards, sloth bears and hyenas all roaming across this incredible landscape. We’ll then head back to the resort where you can spend the rest of the day chilling by the pool, sampling the delights of the organic farm or relaxing at the spa. Come evening, we’ll head out into the jungle once again for a dusk safari. This is another great time of day to witness the tigers in their natural habitat, whether they’re revving up in hunting mode or sleepily nurturing their young. Fingers crossed for some cute cubs. After breakfast we’ll hit the road for the four-hour drive to the historic pink city of Jaipur. You’ll be greeted with a kaleidoscope of colour and sound in the dynamic capital of Rajasthan. What’s more, you’ll be staying in the decadent surrounds of a palace, complete with a maze of lavish archways and serene courtyards. Indulge in a massage or two here, or take a dip in the shaded pool. This evening, get set to experience amazing Indian hospitality at a cooking class with a local family. You’ll be welcomed into a local home as you help make Indian dishes and experiment with daring flavour combinations. Get to know your chapati from your churma as you feast upon the spicy goodness of a home-cooked Indian meal. In this intimate setting with local Jaipurian people, Chai tea never tasted so good. Who’s up for some laughing yoga? Today we take a sunrise bike ride through the city, discovering what everyday life is like away from the tourists. We’ll cycle into the oldest part of town, where you can admire the five-storey Palace of the Winds before parking your bike and wandering through the streets. Mooch through the old town markets, choosing fruit and veg offerings to take to the nearby Krishna Temple. We’ll join in with the morning ritual as the colorfully-clad locals chant incantations in a frenzy of incense and worship. After we’ll head to the park for a spot of ‘laughing yoga’ – an experience quite unlike your average yoga class. Then, we’ll explore another Jaipur speciality: textile printing. If there’s time we’ll handcraft stencils ourselves, before printing our designs on t-shirts. The evening is yours to hit the palace pool and order yourself a beer – what with all the adventure action of the past few days, you’ve earned it. We’re accustomed to early starts now, so this morning there’s an optional sunrise hot-air balloon ride over Amber Fort. This is an amazing sight to behold, as fiery skies illuminate the Rajput architecture. For those of you wanting a lie-in, you can join the group down at ground level where we’ll all explore the fort on foot. Wander through the mirror-clad room and mosaic-filled hallways, admiring Hindu-style motifs, majestic ramparts and cobbled pathways dating back to 1592. From here we’ll drive two hours into the countryside to Bishangarh and check into our very own luxury fort. Perched on a striking granite hilltop, this stylish fort has panoramic views of the Rajasthan countryside. We’ll settle in before hiking the ancient Aravalli Hills, trekking through the oldest plateau range in India with a high tea picnic en-route. Back at the fort, you can put your feet up and relax with chai tea on the terrace. It’s a tough life. Awaken in your fort and warm up with a lazy start to the day. Spend the morning chilling with an ice-cold mango lassi by the infinity pool or relaxing at the spa. After a hot stone massage or ginger-infused facial, find a spot in the fruit orchard for a fragrant spot to relax. Then, from the calm to the crazy, we’ll hit the road and return to the madness of Delhi. Back where your adventure all began, Delhi round two will be spent dining with young professionals living in the city. After discovering the ancient history of Old Delhi, this time we’ll head to a trendy bar in New Delhi where you can learn all about modern urban life. Share stories of your Indian travels with local city dwellers, reminiscing about the sights you’ve seen and getting the scoop on local culture. Grab a round of rum pannas and let the fun begin. Fly into and out of Indira Gandhi International Airport, New Delhi (DEL).